If you missed the Sport and Society Dialogue Series the first time around, now’s your chance to view this exciting piece of Olympic history through cIRcle, UBC’s digital repository. 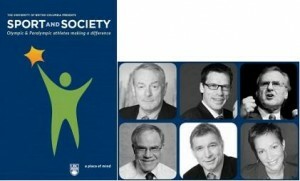 In February and March of 2010, leading experts and advocates gathered at UBC to participate in five thought provoking discussions on a range of Olympic related topics from ethics and sustainability to inclusivity and social responsibility. Only through cIRcle are the complete recordings of this series available to anyone, anywhere via the web. Listen to high profile speakers such as former Paralympic athlete Rick Hansen and Stephen Lewis, former UN Special Envoy for HIV/AIDS in Africa, discuss the power of sport as a vehicle for social change. Sport, Ethics and Technology: Is High Performance Sport Inconsistent with Ideals and Ethics? Sport and Inclusion: Are Major Sporting Events Inclusive of First Nations and Other Groups? Sport, Legacy and Sustainability: Is it Worth It?